Have you had enough of holiday music?! Celebrate Tremont 647's 13th Anniversary! Davis Square Midnight Madness Tonight! Kickass Cupcakes Cocktail Hour Tonight! Head to Inman Under the Stars Tonight! Hit Up the South End Side Walk Sale Today! No, I don't mean the hangover film...these are things to do to get over your hangover you are building up tonight. How does free ice skating and cupcakes sound? in South Boston and Kelly Skating Rink in JP(Stony Brook T Stop – Orange Line). For information on both the rinks and the parks hiking schedule, click here. Lastly, as we all know, boston gal loves her cupcakes. So the Ritz Carlton is hosting its last Ho Ho Holiday Tea (with cupcakes) on Saturday. You get tea and a flight of 5 mini cupcakes for $22. Sounds fabulous. Click here fore reservations and more. So maybe I shouldn't have been the first Boston on the go-er to head over to Coppa, Ken Oringer's and Jamie Bissonnette's new Italian joint. I am a big fan of Toro, their Spanish Tapas restaurant, so I came in biased and ready to eat. Little did I know the wait would be an over two hour wait (both Toro and Coppa do not take reservations)but the staff was very nice to recommend other bars in the area to grab a drink at while you wait (Coppa is small, so don't expect a seat at the bar immediately). So just to forewarn you - know you will wait, unless you show up at 5:45pm when dinner starts. The menu is split up into starters, small dishes, pasta and pizza. The risotto balls were delightful and only $5! And there are short ribs on the menu that I think everyone should get - the marinade was delightful. The lasagna was a crowd pleaser, but I went for the calf brains ravioli and found the sauce wonderful but the brains...interesting. Perhaps I am not as adventurous as I thought. :) The pizzas are a good size (1-2 people per pizza) and I can say that the oxtail/bone marrow pizza tastes just as good cold the next day as it does hot. The cocktails are fun and reasonably priced at $8 and the house made gelato is a must get for dessert. Coppa is located at 253 Shawmut Ave and I'd recommend parking along Washington or Tremont. Coppa is opened from 5:45pm-12:45am. Enjoy! This year the folks behind the Boston Common summer Shakespeare festival are bringing us some winter tales in the Fort Point Channel. The Project will be performing "A Midsummer Night’s Dream" in a gutted warehouse and will be performing other plays later in the year. Midsummer runs at Midway Studios from December 30-January 24. Catch it before January 1st and tickets are only $20-$30, and after the 1st tickets increase to $25-$47. For tickets and more information, click here. I've always thought that First Night is for families, but there is some fun stuff that the rest of us can enjoy. Here's a list of a few things I would check out. Most of these events will require a First Night Button for entry. For details on where to get a button or to order online (you get $3 off online) check out www.firstnight.org. From the people who bring Free Shakespeare to Boston Common: A Shakespearean Cabaret! Shakespeare has inspired countless composers - Verdi, Rossini, Benjamin Britten, Cole Porter, Rogers and Hart, and Bernstein, to name a few. In collaboration with New England Conservatory, CSC will present a collection of funny, beautiful, touching modern and classic songs from and inspired by Shakespeare. Bands that will be playing First Night are: The Neats who will play at the Orpheum along with Buffalo Tom and The Lyres (sponsored by The River). The Parkman Bandstand features Jordan Valentine and the Sunday Saints, with The Fatal Flaw. Jenny Dee and the Deelinquents bring their girl group sound to The Park Plaza. The Painted Lights, Walter Sickert and the Army of Broken Toys and Cirkestra play at the Hynes, and Emmanuel Church features a triple bill of Drew O’Doherty, Kristin Hersh and Chris Brokaw and Geoff Farina performing pre-WWII country blues. Boston’s own Bombay Cinema programs 10 hours of the best of Bollywood film for First Night. Visit www.firstnight.org for titles and times. As usual, holiday songs have been hammering into our consciousness the day after Thanksgiving. Personally, I am not too much a fan of holiday songs... I like them in minute doses. So, this is for all those peeps who share the same sentiment with me regarding the holiday music. Here is a little musical treat. I promise this will put a smile on your faces and make you all warm & fuzzy :) Check it out! I hope listening to this song will transport you to a warm beach town. Enjoy! So the weather out there is pretty frightful and Sportello is making sure you have some fun while you stay inside. This Sunday the restaurant/bakery is hosting a Gingerbread House Workshop. The workshop runs from noon until 5:00pm. Sportello is located at 348 Congress Street. Click here for more. Photo courtesy of Daily Candy. As many of you may have heard, the NHL's Winter Classic will be held this New Year's Day in Fenway Park, with the Flyers facing off with the Bruins. Tickets for the actual game are obviously quite difficult to obtain. It may be just as difficult to get the tickets that are available to Boston residents for free skating on that rink on Jan 3 and Jan 10. The boston.com post about this. Tickets can be obtained this Saturday morning. Aristo Cafe has recently opened downtown at 92 State Street. Hours are Monday - Saturday 7am to 6pm. The hopes are to add Sunday hours in the future. Coffee, baked goods, and lunch items are served. Breakfast sandwiches will be available starting this Thursday. This is the old Finagle-a-Bagel location on Merchants Row, which sadly closed earlier this year (Sandra, Iris, and Lulu are deeply missed). For more information, call them at (617) 391-0478 or stop by for a visit. Hopefully we'll get a review for you in a couple of days once they have a chance to settle in more. Head over to the South End to celebrate with the crew at Tremont 647 tonight! Throughout the night the kitchen will be offering hors d'oeuvres for all to enjoy, while the bartenders shake up several of the most delicious classic Tremont cocktails. Mingle with new and old friends, and take a look at Chef Andy Husband's newly released second edition Fearless Chef cookbook, which will be available at a discounted rate for the party only. The event is free, with a suggested $10 minimum donation to Share Our Strength. The Beacon Hill Holiday Stroll starts tonight at 5pm ... with a Christmas tree lighting at 7pm at Charles and Mt. Vernon streets. Stroll through the neighborhood shops and restaurants tonight looking for items on your holiday shopping list or for just a bite to eat. There will be a Santa, carolers, and other winter merriment. Tuesday, November 8 is primary day in Massachusetts. So ... remember to vote! This primary will determine which candidates will run for the US Senate seat that was held by Senator Ted Kennedy (held in the interim by Sen. Paul Kirk). The winners of each party will face off in the special election on January 19, 2010. For more information, please visit the Secretary of State's website. Done with Black Friday and Cyber Monday? Me too. Go out and support your local businesses' at tonight's December Midnight Madness shopping event in Davis Square. For those new to Midnight Madness, local stores will offer sales until midnight at a collection of Davis Square retail stores and restaurants from 6:00pm-12:00am. Shops participating include: Black and Blues, Magpie, Davis Squared, Dave's Fresh Pasta, Kickass Cupcakes, Artifaktori, The Boston Shaker, Suneri, and When Pigs Fly. Many shops are offering live music, snacks and drinks. Boston gal's recommendation? Stop by Dave's Fresh Pasta for their wine and cheese tasting. Yum. Boston is getting its fair share of lux hotels. First the W and now the the Ames Hotel, located at One Court Street, or City Hall Plaza. And inside this Ames Hotel is the new Woodward Bar. Woodward is a contemporary tavern from Mark Goldberg and the folks behind Mistral. Sounds like it will be another venue for cocktails and people watching - two things that are always my favorites. For more info on Woodward and the hotel, click here. Opera Boston is celebrating National Opera Week (Nov. 13—22) along with opera companies all over the country, by presenting a FREE installment of the popular Opera Boston Underground cabaret series on Wednesday, Nov. 18th. This special National Opera Week program is called “Operatic Acrobatics: Opera Without a Net", will be presented at the intimate Lizard Lounge (1667 Massachusetts Ave., Cambridge). This FREE show is 21+, and reservations are not accepted. Doors open at 7 p.m., and the 45-minute show starts at 7:30. Ice skating novices and aficionados should jot down Thursday November 19th on their calendar as the day the Frog Pond reopens for the season. Opening night will feature special events. Follow the jump for hours and prices. Special hours on Christmas Eve, New Year's Eve, and New Year's Day. Closed on Thanksgiving and Christmas Day. Oh, I'm excited for this one, folks. Central Bottle, a new wine and provisions store is opening in Central Square today. It's going to rock your world! What is unique about Central Bottle is that they will be offering wine maker videos (using Skype), Thursday wine bars and local chef pairings. In addition, you can contact the place for private parties - in store or at your home. Central Bottle is located at 196 Mass Ave (near Novartis) and is open Mon-Wed & Fri-Sat 11am-8pm, Thursday 11am-9pm and Sunday 12pm-7pm. For more info, click here. So did you go to the "Ball Brawl" meatball event a year ago at Dante and love it? Yeah, some of us did too. And the folks at Dante read our minds, like an Edward Cullen, and are giving us Ravioli Rumble this Sunday for a mere $20. The event will take place on the patio and will establish who's got the best raviolis in the city. You be the judge - tasting all of the tasty creations, and mingling with Boston's award-winning chefs. The chef who creates the winning raviolis will receive a grand prize. Chefs from the following restaurants are planned - Restaurant dante, Prezza, Toro, Harvest, Tremont 647, Sage and many, more. Reserve your spot at Events@restaurantdante or 617-497-4200. Ciao! Goodbye Don, Betty and Peggy - I will miss you. Calling all fans, head over to Noir tomorrow night and bring out your inner Don or Betty. The party gets started at 9:00pm with retro drinks and snacks and the show is presented at 10:00pm. Enjoy! As G Funk mentioned to you yesterday, we are hoping you are rockin' the vote today. And when you are done, I have some fun news for you today. It's been in the grapevine for awhile now, but Kendall Square is getting some new restaurants. EVOO, which now resides on Beacon Street in Somerville will be moving over and the same proprietors are bringing Arlington fave Za to the same location as well (this will be Za's 2nd location). Za features great pizzas and salads. Opening is planed for around February 2010. Sasso in Back Bay is now being called Lucca Back Bay. The menu will be very similar to its parent restaurant in the North End. The Regal Beagle opened in Coolidge Corner recently. It's from the folks who brought us Church. The vibe has been said to be lounge/bistro and features a bar with 20 beers and fun cocktails. Anything with lobster roll sliders will drag me out of the house. :) The Beagle is located at 208 Harvard Street. Lastly, Bistro du Midi will open by the end of November in the former Excelsior spot on Boylston Street. Expect upscale dining at its best. It's open - from the folks who brought us Silvertone, the old Abbey Lounge in Inman Square is now Trina's Starlight Lounge. The team brought in consulting chef Greg Reeves from Green Street Grill to cook up a a classic menu of burgers, hotdogs, chili, beer and fried chicken and waffles. Yum. Click here for more info. Trina’s Starlite Lounge is located at 3 Beacon Street in Somerville. For one fine night, every college student's four favorite words come together at the Museum of Fine Arts, Boston. The MFA is always free for University member students, but this party is just for you (and several thousand of your closest friends)! All you need is your valid college ID. There will be events all night long! Rock out to the "funk fusion party" that is LOVE IN STOCKHOLM! DJ GHOSTDAD spins electro, hip-hop, and "a little bit of everything!" Munch on Mexican, compliments of QDOBA! You won't believe what we're giving away... Everything from iPods to a year's supply of burritos! + Back by popular demand, Berklee College singer/songwriter LIZ LONGLEY, whose music John Mayer describes as "just gorgeous." + Shake your thing with HOOPING HARMONY'S Hulahoops! + Drawing in the galleries! + Oh... and, of course, lots of ART. Enjoy over 30 bands, street food and more tomorrow at the Allston Street Block Party along Harvard Street from 12:00pm-6:00pm. Click here for more. Ok nerds. Here's your chance to rock the party. Tonight in Kendall Square the folks at New Scientist are hosting a free party. From 4:30-7:30pm, if you are 21 and over enjoy drinks and more at the party. New Scientist would like you to RSVP, but its not required. To RSVP and for more info, click here. Celebrate Haitian Culture in Union Square Tomorrow! Union Square Somerville is continuing their Union Arts events this weekend with LA Grande Fete: A Celebration of Haitian Culture. Enjoy Kompah(Haitian house dance) and a live Haitian band, while vendors will sell Haitian food. Learn about organizations that provide social services here and in Haiti, too. The event runs Saturday, from 4:00pm-7:00pm with a rain date of Sunday, Sept. 13. Click here for more info. There is no better way to kick off open studios than with a three day festival. At Christopher Columbus Park (the park near Tia's and Joe's American Bar) there will be three days (Friday, Saturday and Sunday) of free performing art acts and artists selling goods. The artists go from well known on the art fair scene (Boston gal loooves those Boston Coasters!) and divine glass and metal work artists. My picks for performing arts? On Saturday, check out the Boston Ballet at 2:15pm, Opera Boston at 3:30; Hayley Jane and the Primates (local rock) at 4:15 and the Motion Sick at 4:45. And on Sunday, a Night at the Rock Opera to end the whole day? Yes, please. For the whole listing of performers and artists, click here. I didn't love the newest installment of the Indiana Jones movies either. But I did love the classic Indiana Jones and the Raiders of the Lost Arc - and thankfully it's playing for free tonight in Somerville. Tonight at 6:30pm at the Somerville Central Library (79 Highland Ave) at 6:30pm enjoy the classic Indy movie. The movie is free and open to the public. Enjoy! Hi all. We were MIA for awhile. But back from vacation, we're ready to hit up the area for some drinks and tunes. And were else than River Gods in Central Square. Tonight, the bar is hosting Filmbeats - Music on Film. The tunes start at 9:00pm. May I suggest the white bean spread for a snack? It's quite delish. Yum. Head over to Kickass Cupcakes in Davis Sq for Cocktail Hour tonight. From 5pm-7pm enjoy mini cupcakes inspired by cocktail flavors. Yum! Click here for more info. Enjoy this month's free admission to the MFA today. The museum is open from 10:00am-9:45pm. Two exhibits to check out: "Seeing Songs" and "Greene and Greene." If it's nice out I recommend hitting up Chinatown for the series "Films at the Gate" tonight. Flims at the Gate starts tonight with "A Chinese Ghost Story" a comedy/horror film about a hapless young scholar who loves a ghost and must learn to fight the demon who has enslaved her. The movie in in Chinese with English subtitles. Movies are shown on the vacant paved lot on Hudson Street between Beach and Kneeland Streets, just south of the historic Chinatown Gate. Films start at 8:00pm. Folding chairs are available on a first come, first served basis. The films will run all weekend, and are free and open to the public. Click here for more info. There are many reasons why Boston gal loves the Brattle, and their homage to John Hughes this Saturday is just one of them. Bring it 80's Sing Along Prom! The Brattle and The Action Pack are here to give you a chance to re-live (or live for the first time) the magic of the 80s prom with a brand new sing-along show featuring all the best music from the era, as well as paying special tribute to the musical moments from the films of dearly departed director John Hughes. WFNX's Julie Kramer will be spinning the tunes. Formal prom attire is very much encouraged. And best costumes will win prizes. And remember, the Brattle sells Cambridge Brewing Co. beer, so you are allowed to get buzzed at this Prom. :) The event starts at 10pm on Saturday, doors open at 9:30pm. Tickets are $10 for members/students, $12 for general public. Buy your tickets now, your dress tomorrow, and gel later. Click here for tickets. Photo courtesy of the Neal Peters Collection. It's hot, I know. I've been hiding near the fan with some Olecito tacos. But enough is enough. So tonight, head over to Inman Square for a good old movie and a neighborhood social. From 6:30p.m. to 11:00p.m., tonight join the Inman Square area for some fun. Pre movie, enjoy live entertainment and discounts from area stores. At dusk, (8pmish)the movie (this alien, phoning home) will start. So,set up a lawn chair or blanket at the East Cambridge Savings Bank's parking lot (1310 Cambridge St., next to S&S Deli, between Hampshire and Cambridge Streets), and enjoy free popcorn, (bottled) water and iced tea. Alright mexican food lovers, you have another place to go near Kenmore Square now. Olecito (the original being in Inman Sq in Cambridge) has opened a new spot on Comm Ave.
Olecito is a fun take out spot with burritos, tortas (a yummy type of sandwich), quesdillas and tacos. May I recommend the baja (shrimp) tacos? They are muy delicioso. Olecito located at 700 Commonwealth Ave. So the folks over at the Milky Way have realized that we miss bowling and eating their good food, terribly. So tonight, they are hosting a virtual bowling night - via the Wii. So head down to JP and play Wii Bowling, projected onto the Milky Way's Brewery Space walls. not only fun, but it's free. The games begin at 9:00pm. And if you miss out this month, it will be held the third Tuesday of every month. Enjoy! The former Circle Plates Lounge (which unfortunately, didn't last long) has a new owner - the Stork Restaurant and Jazz Lounge. Stork Club will offer live music seven nights a week, with a variety of music genres - jazz, Latin, Afro-Cuban and blues. The menu for the restaurant will offer some southern hospitality - buttermilk fried chicken, meatloaf (w/bacon!) and my fave, mac & cheese with ham. Hmm...pork. 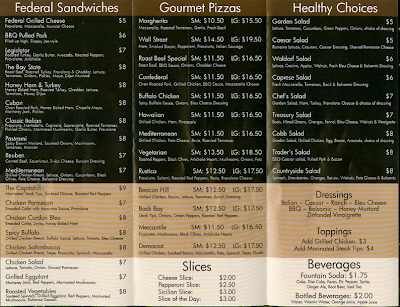 For those watching their wallets, have no fear - there is a late night bar menu too. Stork Club is open at 5pm daily and is located at 604 Columbus Ave.
Are you dying to find out what Don was up to? Is Betty going to take him back? Well, find out at Sunday's Mad Men Premiere Party at Noir. Noir, located in the Charles Hotel in Harvard Sq will be airing the show on their HD projection screen. They are encouraging 60's, Mad Men gear, and prizes will be handed to those with the best Mad Men look-a-likes. In addition to the contest, classic cocktails and retro snacks reminiscent of the era will be offered. Just no cheating husbands, thankfully. Party starts at 9:00pm. If you need some help with what you would look like in the 60's, click here. Photo courtesy of ew.com. By Friday, we all feel like drones, or better yet, recovering from a hang over from the night before's "pre weekend" partying. Well the folks at the Rose Kennedy Greenway have just the afternoon pick me up for those of us who don't work at Google. Head over to the Greenway to play "Game On!" during your lunch break. Knuckle Bones and the Greenway Conservancy host favorite backyard games like ring toss, badminton, Baggo®, ladder ball, bocce, jump rope, and tetherball in the Wharf District and Dewey Square Parks along the Greenway system. This is every Friday in August from 12pm-2pm. Enjoy! Did you know, since its opening, Eastern Standard has sold over 21,000 Whiskey Smashes? That's a lot of liquor. And to celebrate, the Standard is hosting a Whiskey Smash Bash next week. Eastern Standard's Whiskey Smash Bash will offer the classic drink, with new flavors and old ones (I like the idea of peach, personally). In addition to the drinks, chefs will interpret the best version of bar food and you'll get some local celeb bartenders to tend to your needs. All in all, sounds like a delightful night. Tickets can be purchased at the Eastern Standard bar, and cost $30.00 (includes entry, one Whiskey Smash and food). Click here for more. Tajine, a new Moroccan restaurant opened at 1105 Mass Ave near Harvard Square recently. So far mixed reviews (sounds like the new restaurant is getting the kinks out of the way) but hopefully we'll report more soon. Whether its brunch or you need a new dress, South End businesses should be able to hook you up. Sales end tomorrow, which fits in for a perfect day to go to the SoWA Market, too.Click here for a list of participating businesses and restaurants. The Institute of Contemporary Art's Friday night music series is back, and better than ever. For a $25 (or $20 if you are an ICA/World Music member) you can enjoy some great DJs and experimental music. Some highlights of the series includes DJs from an Argentinian club (get ready for some dance hall! ), afro influenced pop, and more. All concerts begin at 7:30pm and may be outside if weather permitting. Click here for tickets and the full line up that runs til October. Pick up a labeled artichoke right now at Liberty Square in Downtown Boston, and redeem it for a free sandwich from Pressed Sandwiches. Liberty Sq is around Batterymarch St and Water St. I love the Harbor Islands, and most importantly, I love rock music. So it's about time Berklee's up and coming bands and the Harbor Islands join forces for an all day concert. This Saturday, from 1:00pm-4:00pm, enjoy the sounds of Mark Hopkins and the Hotel and Abigail East, to name a few. It's $14 for a round trip boat ride to George's Island, so back up a picnic and rock it out. Click here for more info. Photo courtesy of the artist, Mark Hopkins. Head over to the Hatch Shell on the Esplanade tonight for a free concert part of the Landmarks series. The night's theme is "Damsels in Distress" and will feature the MIT Summer Philharmonic Orchestra. Concert will begin at 7:00pm. There is a rain location at MIT. Click here for more info. So director Ang Lee (Brokeback Mountain, The Hulk) is coming out soon with a film about Woodstock, and as the 40th Anniversary of Woodstock approaches, the International Poster Gallery is giving us a great lesson. Habibi's Lounge opened in Allston right next to the Wonder Bar. Habibi's Lounge is Boston's newest hookah lounge. Habibi's has over 30 different types of tabacco flavors, and a variety of middle eastern snacks and desserts. Hmm baklava. Habibi's is open Monday - Thursday from 6:00pm-1:00am and Friday-Sunday 4:00pm=2:00am. Click here for more. Photo courtesy of Habibi's Lounge. Head over to the Charles River tonight for some swing dancin'. Swinging on the Charles is outside underneath the twilight sky along the Charles River on the docks of the Community Boathouse tonight. The dance features beginners dance lesson which gets started at 7:30pm. The dance starts early at 8:30pm and ends at 11:00pm. General Admission is $10 and students and seniors are $8. If rain, the dance will head into the Boathouse. Click here for more info. The new Kendall spot, The Friendly Toast is still working out the kinks of its new location, but is a nice and much needed addition to the area. You should expect a little bit of a wait on Sunday for brunch and be patient with the staff. I would recommend calling before heading over if you can - they are opening some nights of the week (they have a full bar), but not all - again, they are just trying to get the kinks worked out. Nonetheless, take a chance on this diner before or after a flick at the cinema. 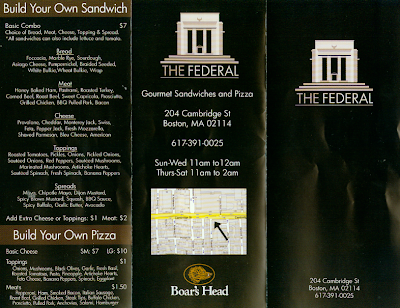 The Friendly Toast is located at One Kendall Square, right near Flat Top Johnny's. For more information, call 617-621-1200. Good news: some places are opening. Bad news: Icarus closed. Icarus, a South End favorite, has closed. After 31 years in the neighborhood, the restaurant is saying goodbye. No word on what's replacing it. In October, plan to see the new Clarendon Bldg (corner of Clarendon and Stuart) to have a new restaurant - Post 390. The former chef at the Excelsior will be taking over the new restaurant menu which is going to be cheaper than his former restaurant. In the old Excelsior spot, the owners of Grill 23 and Harvest are planning to open a Mediterranean/French restaurant in the fall as well. Lastly, the old Last Drop location is a new tavern - The Corner Tavern. They will be surving food until midnight, offering 17 wines by the glass, and a selection of whiskey, single malts and tequilas. Sounds like that may be dangerous. Corner Tavern is located at 421 Marlborough Street. Click here for more. Some businesses do well in a down economy - and Upper Crust is one of them. Upper Crust opens it newest location in the Fenway. Located at The Upper Crust Pizzeria Opens in FenwayThew new location is at 1330 Boylston Street and open from 11:00am-11:00pm. Another bargain before a game at Fenway? Check plus.